Fruit Salad or Custard with Fruits is yet another blast from the past! This is one of those dishes I remember Amma making often during our school days. I am not sure since how long we had these custard powder available in our market, but it was during my high school that I first tasted it. We lived in a colony and Dad used to arrange frequent get together with the colony folks. We used to meet ahead of the dinner date and plan. Then the aunties used to meet again to discuss the menu. Somehow I was always part of such discussions not really sure why. Guess most knew that I was always interested to be part of their discussion as much as they wanted me to be part of their discussion as well. Maybe it had to do with the fact that even then I used to listen to what they say while my friends would never want to do anything with aunties talks. I was most interested to hear how they cooked something, wanting to know more details. Anyway the entire discussion would be so much fun, planning what each family will bring for the party. For the eve, we used to have loads of activities and all of us had so much fun. We used to plan games, singing etc and imagine all those aunties and uncles taking part in them. These parties used played to break the ice, and we start looking at the aunties, uncles in a lighter view. Thinking back, I realize I miss those occasions. It played a great role in forming memories and things I can now think back and feel happy. I feel bad that my kids don’t have that kind of good memories for them to later think back. When I was wondering what to make for the last day of the BM#5, I had an option to share a dish I had already done or make something new. 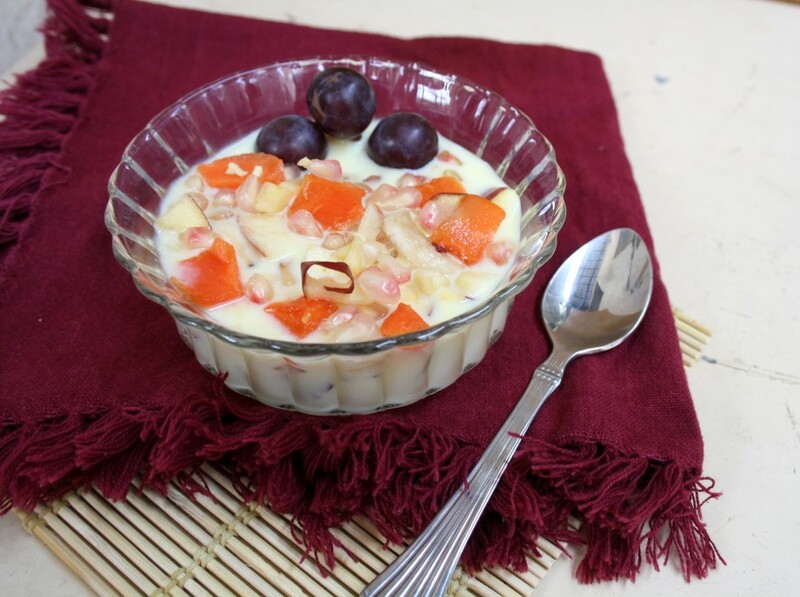 I preferred to make this vanilla custard with fruits. Konda had learnt to make this along with her friend K during this summer. K’s mom took a cooking class for both of them this summer and taught them some simple dishes. When Konda made this first time, she was so excited and got her share of the portion for us to taste. Hubby dear thinking there was more, finished off the entire cup. He said it was so good that he didn’t realize. So she made again for her daddy and rest of us. Knowing that she will love to make it again, I had got the packet for her. So I called her to make it. Seeing how we did it, she said she knew better and we let her make it. Bring the pan down, add the custard. 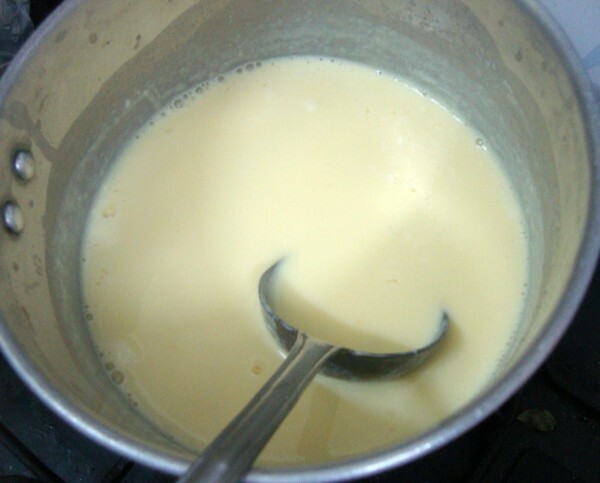 Cook again to get thick custard. 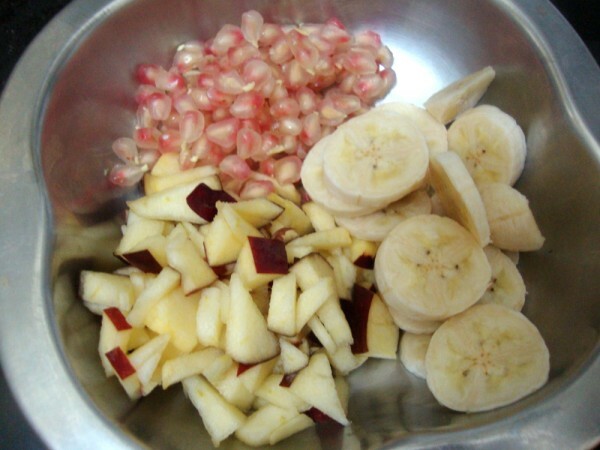 Have the fruits chopped and ready when you want to serve the custard. Apple, Banana, Grapes, Pomegranate, Papaya as required. Bring the milk to boil. Simmer once it starts boiling. 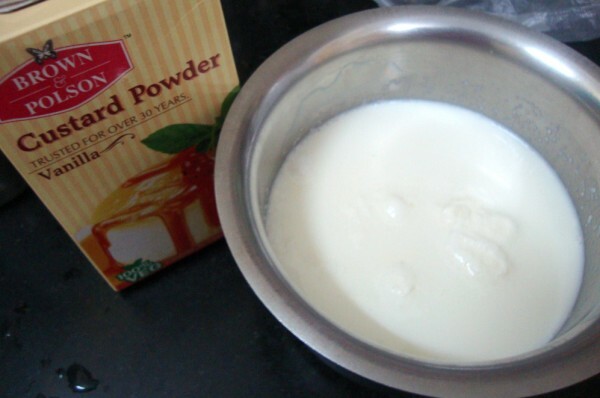 In a bowl take the custard powder and slowly mix with the milk to get a lump less liquid. 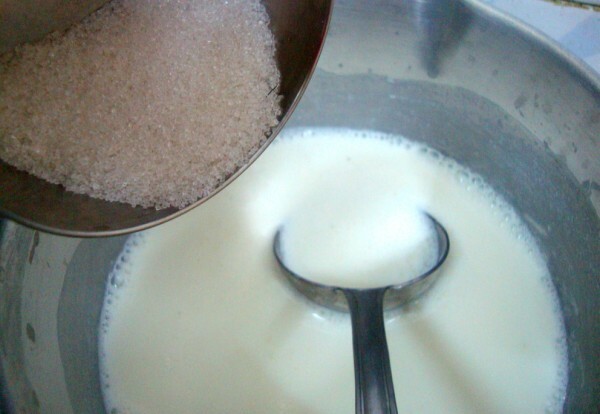 When the milk is still simmering, add the sugar and cook in high while you keep stirring. 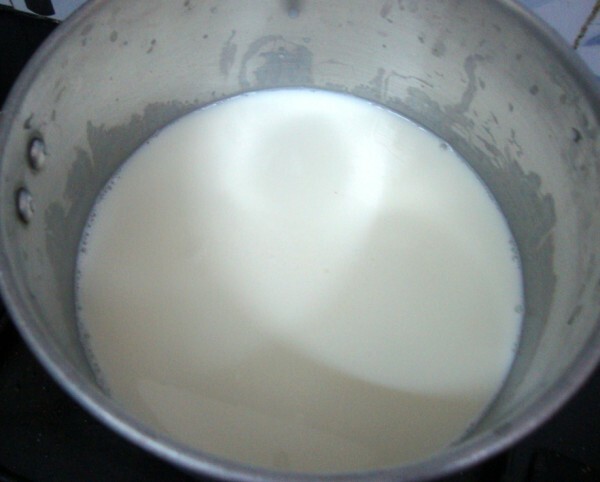 After about 3 -4 minutes, the milk starts to thicken, remove from the stove, slowly add the mixed custard and combine everything well. Again cook for 4 mins or till the liquid is thick enough. 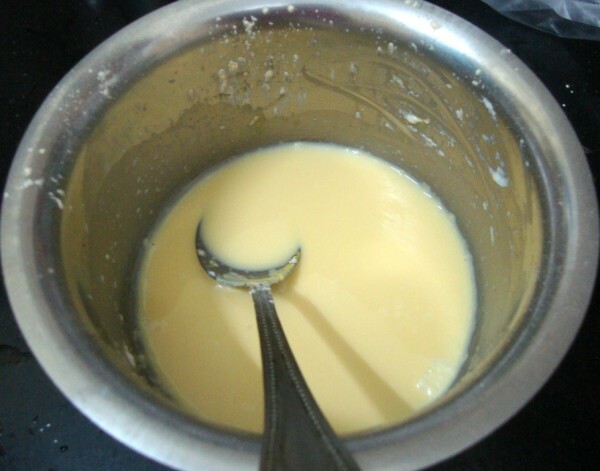 Thickness of the custard is entirely on how we want to serve. Once done, allow it to cool and chill it. 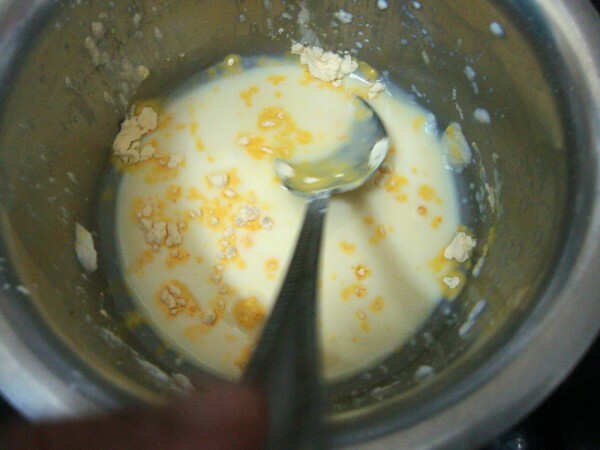 When ready to serve, chop all the fruits and add to the custard and serve it chill. 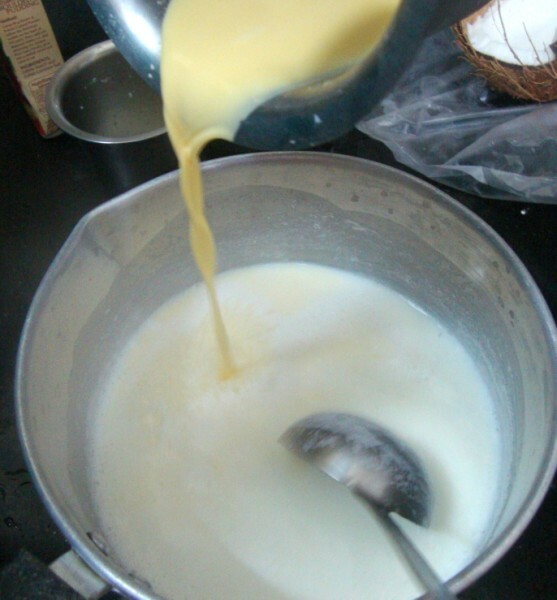 Though the fruits is added along with the custard and chilled normally, I prefer adding the fruits before serving. This ensures you can store the custard as such and not spoil the fruits. When you add the fruits, it’s advised to complete the dish and not store further. Always chop the fruits just before serving as apples, bananas tend to colour. 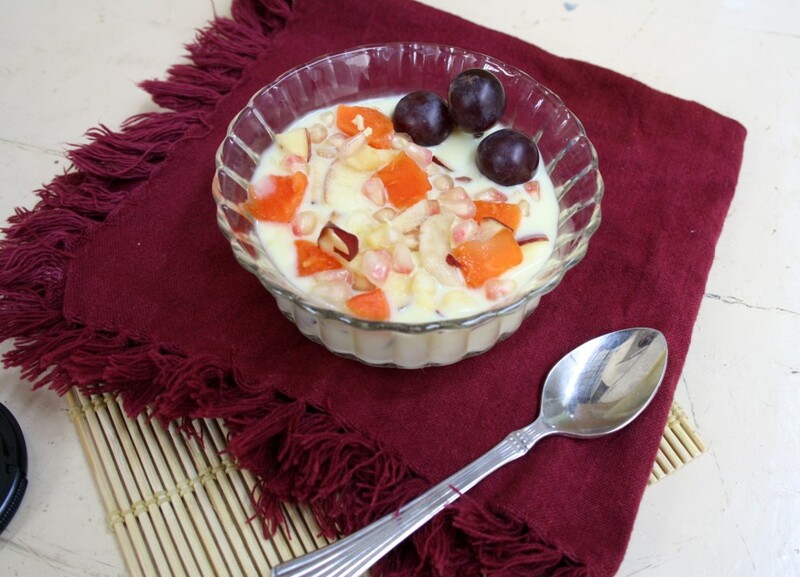 Am a great fan of custard fruit salads,wonderful bowl, makes me drool..
My all time favorite, simple and delicious! Lovely write-up … Great memories you shared! Thats sweet of Konda!! My kids love custard and so do we. This is a favourite with kids. My all time favorite..So sweet of konda. I guess the time is not far, when you can add Konda as co-author of this blog. My mom used to make this often too. I've similar memories of having get-togethers & picnics with neighbors and as you said, they were so much fun and I feel bad that our kids don't get to have these memories. Your daughter is getting to be a good cook already..
What a great recipe, it looks delicious. I think it is very interesting and easy to do, so i will give it a try. Thanks a lot for sharing with us. A classic recipe and I always liked the plain custard, without fruits.